Line small serving plate with waxed paper. Roll each level tablespoon cold pack cheese food into a ball; place on waxed paper-lined serving plate. Refrigerate 10 to 15 minutes for easier handling. With end of toothpick, draw ridges around balls to resemble pumpkins. Dip bottoms of cheese balls in chopped peanuts. Just before serving, insert pretzel halves into cheese balls for pumpkin stems. Decorate with parsley for leaves. Store in refrigerator. Turn the pumpkin making into a family affair! 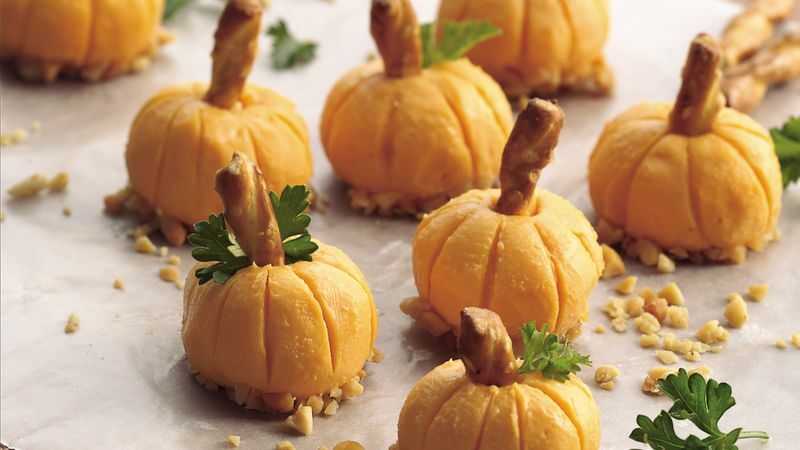 Have one person roll the cheese into balls and another shape the balls into pumpkins, while someone else can dip the pumpkins in peanuts and insert the pretzel. It's easy to double the recipe, so make as many as you'd like! The texture or firmness of cold pack cheese food can vary from brand to brand. Buy two brands, use the firmer one for pumpkins and snack on the softer one while making them!